This vacation rental on Tybee Island conveniently located with easy access to both the north and south sides of the island. A short drive away from downtown Savannah aswell. Looking for Tybee vacation homes for a family trip? Then look no further than Southern Belle. We have an amazing selection of vacation rentals Tybee for any type of stay. Find the perfect Tybee Island vacation house and get ready for a great stay on the beach. For family vacations, the Abercrombie & Beach House is perfect. 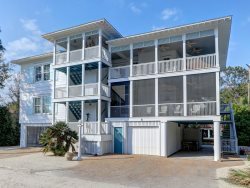 This Tybee Island vacation house can sleep a total of 16 in six bedrooms with three bathrooms. The rooms contain two king beds, four double beds, two twin beds, twin bunk beds plus a fold-out futon. A large wrap-around porch is perfect for gathering outside and enjoying the nice weather. A remodeled kitchen gives you everything you need to make great family meals during your stay. Other amenities include a washer and dryer, off-street parking and only 200 yards to get access to the beach. It's not always easy to find Tybee vacation homes of this size, so if you have a large party, you definitely owe it to yourself to check this one out. The house boasts wood floors and ceiling fans throughout, and the decor is both colorful and whimsical. The kitchen is expansive with plenty of counter space, a big sink and a smooth cooking surface. It's everything you want to feel right at home on the island. Start out by taking a trip to the Tybee Marine Science Center and discover everything about the island's marine ecology. From there, you can book a guided beach walk or take a tour by bike with Tybee Bike Tours. If you're interested in fishing or dolphin watching, then you won't want to miss giving Sundial Charters a call. They can arrange customized trips for you and your party. Spend even more time in the water with jet skis, surf board rental or paddle boarding. Several companies on the island offer rentals for this equipment. Don't forget the Tybee Lighthouse and Museum as it's one of the island's top attractions. Climb to the top and check out an amazing view of the entire island. When you get hungry there's plenty of options. Check out the unique brunch at the Tybee Island Social Club. This charming white bungalow serves Latin fusion with a twist of South Coast. Another popular spot is the Crab Shack on Tybee Island. They are especially known for their margaritas and steamed seafood samplers. If you have a longer stay planned at your Tybee Island vacation house, you won't want to forget about spending some time in Savannah. Enjoy even more great food, local culture and all the interesting history of old Savannah. Make sure to inquire about any events taking place during your stay as well. If you're in town around the first of the month, the First Saturday on the River festivals are a popular draw for locals and visitors alike. A few other Savannah places to see include the Cathedral of St. John The Baptist and the Massie Heritage Center. Enjoy tales of the local haunts with ghost tours from Hauntings or Sixth Sense, or for a daytime excursion, check out the Old Town Trolley Tour of Savannah. Start your Tybee Island vacation with the easiest choice by calling us at Southern Belle and not spending a lot of time looking at all the other Tybee vacation homes in the area. Book one of our amazing vacation rentals Tybee and you can rest assured that you will have comfortable accommodations waiting for you when you arrive. Great friendly service who treated us with the upmost respect. We had a blast for 5 nights and enjoyed every bit of our rental property.